With all of the little league basketball programs available, how do you choose which ones are best for your child? This list of pros, cons, and other important considerations will help you make an informed decision when it comes time to choose between organizations like Upwards basketball, YMCA, NBA junior leagues, and AAU basketball teams. A youth basketball league is a great way to introduce young players to the sport. It's probably the first time many of them have the chance to learn the basketball basics and play in their first basketball game with coaches and officials. Depending on your child's age, experience, and level of competitiveness, you'll have some choices to make regarding the type of league you sign up for. The most popular type of little league basketball programs are recreational leagues sponsored by youth organizations like the YMCA. Leagues like those offered through the YMCA focus on teaching kids fundamental basketball skills and the importance of good sportsmanship. Winning games, especially at the younger ages, is not emphasized, and all players are guaranteed minimum amounts of playing time each game. Upwards basketball is a completely different type of little league basketball experience. It's a Christian sports program for players in kindergarten through 6th grade that emphasizes healthy competition, sportsmanship, and skills building. If you're interested in a sports league with a spiritual emphasis, check out Upward Basketball to find a youth basketball league near you. Got a local NBA team in your area? Some of them offer junior NBA leagues that partner with local community youth organizations to provide kids a fun way to improve their skills and receive awesome perks like a cool reversible Jr. NBA jersey and a FREE ticket to an NBA game! If your child is older and more skilled, you can often find competitive youth basketball leagues in your area. If you really want to expose your son or daughter to a higher level of play, you might check into one of your local AAU basketball teams. Fun - Most kids enjoy being part of a team, making new friends, going to practice, and playing games. Organized game environment – It's exciting for players to have a schedule, anticipate upcoming games, and play in games with uniforms, officials, and all that comes with a real game environment. Learn about teamwork – It's a chance for young players to start learning how teams work, with both the good and the bad, and experience the excitements and the disappointments. Sense of accomplishment – When young people score or make big plays during practice or games their self-confidence gets a tremendous boost. Coach-to-player ratio – Teams tend to be pretty small at the younger ages (8-10 players), so the players can receive a great deal of individual attention. Learn new skills – Kids are introduced to new skills at practice each week and can work on them at home if they want to really improve. Expertise of coach – The coach is a volunteer, often a parent, who may or may not know much about the game and may or may not have much experience coaching young kids. Commitments of coaches – Most coaches are consistent in showing up for practices and games, but there are times when their work schedules or other commitments conflict with the team. Coaching style - Every coach is different and has a unique personality, style of teaching, and demeanor with the players. If the coach is overly aggressive or relaxed in your perspective, it could cause a great deal of frustration for you or your child. Limited playing time - Players get limited playing time during the game, which means limited touches on the ball. Cost – Leagues can be fairly expensive when you figure out the registration fee per number of practices and games. More skilled players dominate the game - The timid players don't get their hands on the ball very much. Intimidating for some - Some players find the experience intimidating and scary, especially at the beginning. Number of games in the season – A schedule usually consists of 8 games, 1 game a week, with the possibility of a tournament at the end. Number of practices scheduled during the week – Make sure the number, days, and times of practices don't conflict with your schedule. Find out how long practices typically last and what happens if your child has to miss. Number of coaches versus number of players – It would be ideal to have at least 2 coaches for a team of 8-12 players. Number of players on the team – 10 players means your child will probably play about half of each game (about 16 minutes total). Some teams have 12 players, resulting in even less playing time for each player. Rules for substitution during a game – Find out if there are little league basketball rules mandating playing time for each player or if the decision is left strictly up to the coach. Attitude toward winning and losing – Make sure your attitude toward winning, losing, and keeping score is consistent with that of the league and the coaches. 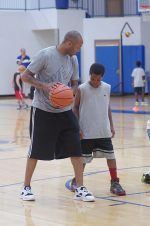 Player commitment – Evaluate what other sports or activities your young player is involved in that might conflict with basketball season or cause fatigue and burnout. Decide honestly if this will be a detriment to the team or your child. I've seen many teams have to forfeit games due to a lack of players because team members had other commitments on game day. Length of season – Traditional youth basketball leagues run from November to January. It is standard to take time off from practices and games during the holidays. Find out what your coach's expectations are for practices during the holidays.